The AT4060 is a cardioid tube condenser microphone with a transformer-coupled output circuit. The tube is reportedly a hand-selected 6922 Sovtek. The mic’s capsule, although described as a large diaphragm design, has a 21.4mm active diameter. The membrane material is 2 microns thick. This capsule is visually identical to the capsules found in the two AT4047 models, the AT4050 and AT4060ST. 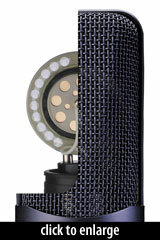 All use a center-terminated 21.4mm-diameter capsule covered by a perforated metal acoustic baffle. In some models, such as the AT4060, this capsule is surrounded (or partially surrounded) by a perforated metal frame. The AT4060 ships with its tube power supply (Audio-Technica part number AT8560), shockmount (p/n AT8447), and a carrying case. The mic was great for vocals, providing a full midrange that was neither thin nor muddy and which cut right through the mix. It also performed quite well on acoustic guitar, capturing the instrument’s full, low-end body as well as its higher frequencies, and it was superb for clean electric guitar sounds and solos, picking up the brighter frequencies and delivering a clear, ringing tone. The Audio-Technica AT4060 is also known as: AT-4060.